This is a guest post from San Diego Architect Kevin Bussett. 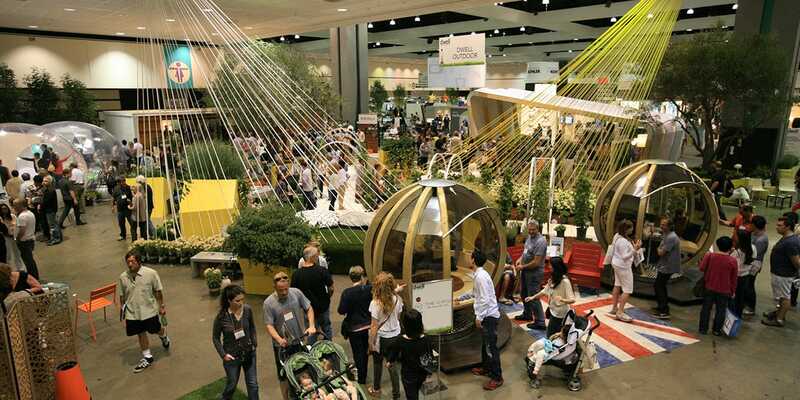 I attended Dwell on Design 2015 as MOVA International’s Official Architectural Liaison (my request to be MOVA Style Ambassador was denied). As an architect, Dwell subscriber, mid-century fan, and amateur gardener, I took notice of several outstanding products this weekend including the Leggy Stands by Potted, the Boxcar Succulent Planter Set by Revolution Design House and Feltware’s playful and bright clocks, bowls, and coasters made from heavyweight felt and warm hardwood. While there were many interesting products to view at Dwell on Design, there were a few products at this year’s show that embodied the spirit of Modernism. Modernism is not just a style characterized by clean lines, clever touches, and a minimalist aesthetic–it’s also a mindset that seeks out new materials and fabrication methods and allows that process of experimentation to create surprising, delightful products. Some of the standouts are old designs that remain fresh and relevant fifty years later, some are new products that pay homage to old techniques, and some aren’t designs at all but rather materials waiting to be explored by future designers. In the 1960’s, German company Deru created animal figures with “an imaginative, origami-like technique of crimping, cutting, folding, sewing, and riveting one piece of cognac colored natural leather.” The concept evokes timeless elements of Eastern design: the figures use the minimum number of gestures to convey a convincing impression but let the mind fill in the details. 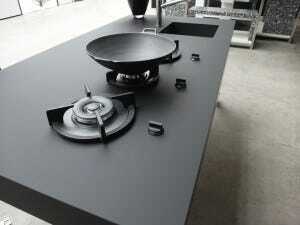 The material is rich and organic but not overworked, and no two pieces are exactly alike. 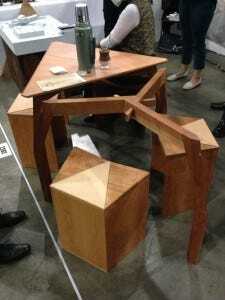 This dining table by recent Woodbury School of Architecture graduate Omar Montelongo uses older Japanese wood joinery techniques to create a very modern-looking table. 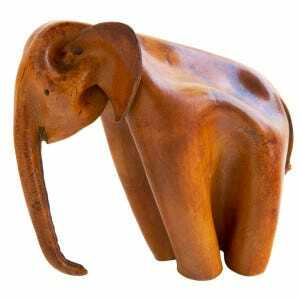 Amazingly, the legs were made using only hand tools–Omar said it actually gave him more control of the building process. 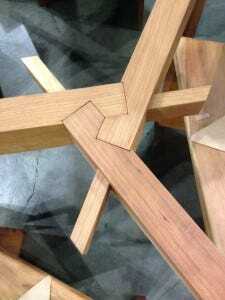 The table requires no glue or mechanical fasteners, and relies only on interlocking connections and wood pegs. Fenix NTM is a finish material similar to Formica that offers superior scratch-resistance, smoothness, and matte finish thanks to nanotechnology. The rep said it’s used primarily in healthcare buildings and labs where durable, non-absorbent surfaces are desirable. The word nanotechnology screams “futuristic” but microscopic robots are nowhere to be seen. Instead, nanotech refers to the way in which ultra-fine droplets of material are laid down to create a surface whose molecular structure allows it to self-heal small scratches with the application of heat. 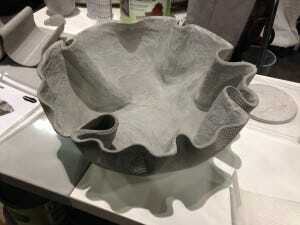 This product is my choice for Best-In-Show because it offers consumers the ability to create complex concrete shapes without complicated molds or expensive, commercial admixtures. Shapecrete can adhere to vertical surfaces like Play-Doh until it hardens so artisans can create lightweight concrete objects with complicated curvature and interior voids without interior formwork or slip casts. 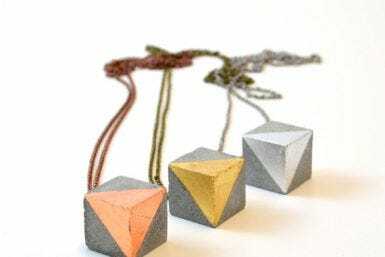 I look forward to seeing how my friends at Studio Corbelle push the limits of Shapecrete to expand their line of concrete jewelry. Towards the end of the show, I had the chance to eavesdrop at the MOVA booth. Most visitor’s first question is, “How is it floating on the stand?” After they have a chance to pick one up and examine it, their second question is, “How does it work?” (No, the answer is not ‘magic.’) MOVA Globes are surprisingly complex on the inside but the finished product is effortless, delightful, and thoroughly Modern. 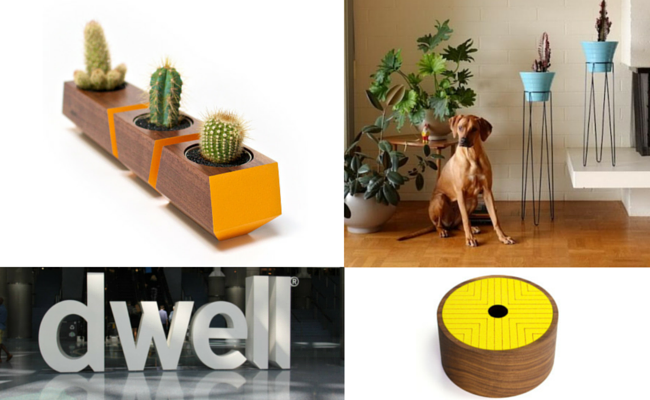 I’m looking forward to following the continued work of these companies and can’t wait to see what new products await at Dwell 2016. This is a guest post from Kevin Bussett, AIA. 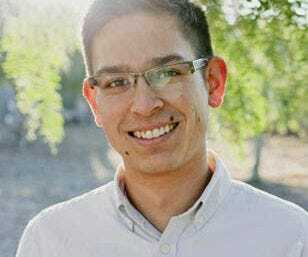 Kevin lives and works in San Diego, CA and is the Emerging Professionals Commissioner for the San Diego Chapter of the American Institute of Architects.